We’d love your help. Let us know what’s wrong with this preview of Lady of Breken Manor by Heather B. Moore. No true lady would steal a loyal man from his fiancée, but what if that lady is a ghost? Lady Charlotte is bored. So bored that when the owner of her manor in Scotland dies, she actually looks forward to haunting, uh, meeting the new owner. Too bad he’s engaged. Because if he weren’t, and if Charlotte could get him to fall in love with her, then the curse would finally be No true lady would steal a loyal man from his fiancée, but what if that lady is a ghost? Lady Charlotte is bored. So bored that when the owner of her manor in Scotland dies, she actually looks forward to haunting, uh, meeting the new owner. Too bad he’s engaged. Because if he weren’t, and if Charlotte could get him to fall in love with her, then the curse would finally be broken. What curse, you ask? The curse that keeps Charlotte confined to an ancient manor decade after decade, playing parlor tricks on unsuspecting visitors. If only being a ghost weren’t so tedious, Charlotte might actually enjoy her life-slash-death. But the new owner is making her rethink her entire existence. Heather B. Moore is a USA today bestselling author who writes sweet romance. Under H.B. Moore she writes historicals & thrillers. Under Jane Redd, she writes Young Adult. There are more than 9,000 5-star reviews for Heather's books on Goodreads! To ask other readers questions about Lady of Breken Manor, please sign up. A Scottish Manor, an inheritance, an ancient curse, a noble lady hidden away, a carriage crash, a ghost stuck in between her mother's anger and eternity. Can anything save her, release her from this curse that unfairly froze her in time to watch others live their lives and wishing she could find love, or even pass on to the next life? Sean finds himself arriving in Scotland to explore his new manor house, left to him by his great uncle, the crazy one who was a recluse and a little bit of a lunati A Scottish Manor, an inheritance, an ancient curse, a noble lady hidden away, a carriage crash, a ghost stuck in between her mother's anger and eternity. Can anything save her, release her from this curse that unfairly froze her in time to watch others live their lives and wishing she could find love, or even pass on to the next life? Sean finds himself arriving in Scotland to explore his new manor house, left to him by his great uncle, the crazy one who was a recluse and a little bit of a lunatic. Sean wants to fix it all up, brush the dust off his hands and sell the place so he can return to his life in Colorado and marry his fiancee Michele. Going to Scotland provides a great little getaway and allows him to get his hands dirty doing some fix it work. What he doesn't expect is her...Lady Charlotte...the ghost. If you enjoy a lighthearted paranormal story, mixed together with humor, a yummy love story (albeit a little fast and short-hey it's a novella) then this one will definitely give you a little tingle up your spine with delight! I loved it! I was honestly hooked from the first few paragraphs. I've read a similar paranormal story several years ago that ended in a way I did not expect(in regards to the ghost) and I wanted to see how Heather B. Moore would pull this one off. Let me just tell you it didn't disappoint. Great closure and wrap up for Lady Charlotte. I was a little sad to say goodbye to her. She is one spunky lady, umm, er ghost. Great sense of humor, slightly frightful when she chooses and definitely a kind ghost when she chooses. Lol. I would love to see this expanded into a full length novel because, well, like I said, I didn't want to say goodbye to Lady Charlotte. Sean was a great hero. I had my doubts wondering if I would like him as much as I liked other heroes written by this author. Should I have doubted? Nope! Heather B. Moore has proven to me once again just why I love her as an author. I love her characters, their growth (even in short novellas), the storyline, the humor, the intensity, just all around everything! Sorry if I'm fangirling here but I just have to be honest, I'm a huge fan! Oh, um, I was talking about Sean and had a little tangent there. Sorry. Sean was swoon worthy and he definitely made somebody swoon in this book. Again I'd love to see more time with these two characters because they were great but for the length it worked for me. Grab a warm drink, comfy blanket and snuggle in because you won't want to shut the pages (ok I didn't want to shut the pages). This is part of the Secret Legends box set available Sept 12, 2017 and then as an individual book in December. So if you can't wait until December grab the box set and you'll get many more fun reads. Content: Clean. There were a handful of mild swear words. A couple kissing in the bedroom and fades out to black. I received a copy from the author. All thoughts and opinions in the review are my own. I’m always a fan of stories where there’s a curse to break, they always make for fun and entertaining reads and this one was no different! I really enjoyed Lady Charlotte’s character, despite being cursed she was fun and feisty. And I loved how Sean helped her find the answer to the second part of the curse while being the first part himself. The way it all ended was just perfect too! Although I did find the story a bit short and kind of wished it was longer. I don't think I've read a book or novella by Heather B. Moore (or H. B. Moore) that I didn't like. I'm amazed at all the different genres and topics she covers. Reading the first few pages I liked Sean and didn't like his fiancee, Michele, so I wasn't surprised when she told Sean he was crazy and left Breken Manor. If I were a ghost I would've driven her away in a heartbeat. I liked how Sean read the history of Breken Manor and found out how Lady Charlotte and her mother died, and when he discov I don't think I've read a book or novella by Heather B. Moore (or H. B. Moore) that I didn't like. I'm amazed at all the different genres and topics she covers. Reading the first few pages I liked Sean and didn't like his fiancee, Michele, so I wasn't surprised when she told Sean he was crazy and left Breken Manor. If I were a ghost I would've driven her away in a heartbeat. I liked how Sean read the history of Breken Manor and found out how Lady Charlotte and her mother died, and when he discovered there were 2 requirements to break the curse he was determined to find the letter of apology from her father. I wish the story could've been longer so Sean and Lady Charlotte could've spent more time together before he found a way to break the curse. I also liked that Charlotte didn't just cross over to the other side--she got to choose. I still want to know why her mother cursed her since it wasn't Charlotte's fault her father never married her mother. She sounds like an awful woman. When Sean inherits a manor in Scotland, he and his fiance, Michele go there to look it over before selling it. He doesn't plan on it being haunted though. Can you imagine? Charlotte was cursed and until that curse is broken, she's forced to dwell in this house. Sean is great! Whether it's fixing the manor up or uncovering vital information for a friend, this man doesn't leave any stone unturned. I really came to adore him, especially when he comes to his senses, and could see why Charlotte is in When Sean inherits a manor in Scotland, he and his fiance, Michele go there to look it over before selling it. He doesn't plan on it being haunted though. Can you imagine? Charlotte was cursed and until that curse is broken, she's forced to dwell in this house. Sean is great! Whether it's fixing the manor up or uncovering vital information for a friend, this man doesn't leave any stone unturned. I really came to adore him, especially when he comes to his senses, and could see why Charlotte is intrigued with him. As for Charlotte, she's a trickster, but my heart really went out to her. The circumstances surrounding the curse fell upon her through no fault of her own, yet she's the one suffering for it. There are some heart wrenching moments in this story, with no foreseeable resolution, and I couldn't help but hope for some miracle to happen to break the curse. I wanted the characters to find happiness and be at peace, even with the slight melancholy feeling that shadows over the pages. I had similar feelings while watching the old 80s movie Somewhere in Time. Although this is only a novella, emotions are high and I was fully invested. Content: mild romance with some innuendo; very mild language. How fun was this book!!?? I love reading romance books with a little twist off "normal". I mean, a boy falling in love with a ghost? He never touched her, he never kissed her. He only spoke with her but the connection was forged and there was no going back. There were plenty of moments in this book that made me smile and then there was Sean. Oh, hello Sean. Guy in love with the ghost. You may think he's a titch off in the head but I'm telling you that he has some awesome swoony moments. I loved How fun was this book!!?? I love reading romance books with a little twist off "normal". I mean, a boy falling in love with a ghost? He never touched her, he never kissed her. He only spoke with her but the connection was forged and there was no going back. There were plenty of moments in this book that made me smile and then there was Sean. Oh, hello Sean. Guy in love with the ghost. You may think he's a titch off in the head but I'm telling you that he has some awesome swoony moments. I loved his devotion to Lady Charlotte. I wish this book would have been longer. At novella length, everything happens so fast. I wanted to stay and wallow around. That's a sure sign of an engaging book! I expected nothing less from Heather Moore though. She is fantastic at writing in many different genres. This one is the perfect light-hearted, paranormal romance. I'm not big into the paranormal genre but if my favorite author is writing it, I'm going to read it. And love it. Such was the case with Lady of Breken Manor. The characters were easy to get to know quickly (which is an important thing in a novella) and I loved seeing them get to know each other and fall in love. Because of the unusual situation of Charlotte being a ghost and Sean being the one who could finally send her to the next life, their love had obstacles to work through and was tested a I'm not big into the paranormal genre but if my favorite author is writing it, I'm going to read it. And love it. Such was the case with Lady of Breken Manor. The characters were easy to get to know quickly (which is an important thing in a novella) and I loved seeing them get to know each other and fall in love. Because of the unusual situation of Charlotte being a ghost and Sean being the one who could finally send her to the next life, their love had obstacles to work through and was tested and tried. I loved how the author made everything work out in the end, and I finished the story with a smile on my face. The amazing setting of a manor in Scotland was another thing I loved about the story, it really set the tone and made it seem like magical things could happen. This is such a fun little book! I love paranormal romances and time travel so this was perfect for me. It was a very quick read, and I think the romance would have really benefited from some more time to develop. I wish this was a full novel rather than a novella. I think the extra time for character development is necessary. Otherwise, this is really fun and sweet and I definitely recommend it. This ebook was provided to me through a Goodreads giveaway. Thank you to Heather B. Moore, the publis This is such a fun little book! I love paranormal romances and time travel so this was perfect for me. It was a very quick read, and I think the romance would have really benefited from some more time to develop. I wish this was a full novel rather than a novella. I think the extra time for character development is necessary. Otherwise, this is really fun and sweet and I definitely recommend it. First, I want to address the ghost love point. I have friends who won't read books with a ghost love interest. They say if you are dead, you are dead. But this one has an interesting twist to it and it's a good one that validates how things work out in the end! So, don't not read it because of that! You will like it! Lady Charlotte has a bit of a reputation in the town. People steer clear of the manor that she haunts! The curse that keeps her bound to the manor is an interesting one. And after ov First, I want to address the ghost love point. I have friends who won't read books with a ghost love interest. They say if you are dead, you are dead. But this one has an interesting twist to it and it's a good one that validates how things work out in the end! So, don't not read it because of that! You will like it! This was a short love story. The whole feeling of this book was rushed. It also didn't feel realistic. It is rare but can happen where the author makes you believe that supernatural stuff can and does happen. This didn't feel real and there were some ghosty inconsistencies. In the first of the book she could touch objects at the end she can't. I hate stuff like that. It is clean and short and filled a couple hours. I am a sucker for ghost stories, especially fall in love with a ghost stories. When Sean goes to Scotland to prepare his newly inherited estate for sale, he doesn't expect a ghost. He also doesn't expect to feel drawn to her. I enjoyed the setting in Scotland, the superstition, the curse that could have Charlotte tied to the manor in the first place. I also loved Sean and Charlotte together. Since she's a ghost, they can't touch or kiss. This led to a story where the characters talk and get to kn I am a sucker for ghost stories, especially fall in love with a ghost stories. When Sean goes to Scotland to prepare his newly inherited estate for sale, he doesn't expect a ghost. He also doesn't expect to feel drawn to her. I enjoyed the setting in Scotland, the superstition, the curse that could have Charlotte tied to the manor in the first place. I also loved Sean and Charlotte together. Since she's a ghost, they can't touch or kiss. This led to a story where the characters talk and get to know each other. The romance was sweet. I loved the tricks that Charlotte played as a ghost, and the way that Sean accepted her, and didn't run away screaming! I loved this! I loved Lady Charlotte's personality and how she spoke out of turn so often. I liked the ending. The only thing I thought should have been different (aside from wishing it were a full length novel) was the amount of time it took them to fall in love. There could have just been a paragraph describing them talking and walking through the gardens together each day for a month or so before they felt like they loved each other. One day doesn't seem like enough. ""“This is sooo romantic,” Michele said as she grabbed Sean’s arm." A Scottish manor, a sassy ghost and a ethereal romance all rolled into this novella that's a quick read and hard to put down. Sean and Michele are engaged and all is going well until the ghost of Breken Manor shows up. Lady Charlotte is weighed to earth by a curse, thanks to her mother, and she can't move on until a couple of things happen. For one, the owner of the manor has to love her. I don't know why I'm the least bit surprised how captivating this newest novel was for me! Just finished a book that wasn't my favorite and picked this one up and completely devoured it in a couple nights staying up way too late!!! I not only liked the story idea but I love falling in love with characters. Definitely a must-read. Loved it! What a fun read. I totally did not like Michele so was happy to see how that turned out. But the lady ghost was a delight! I like the relationship between the Lady and owner. How cool would it be to inherit a manor! Add a ghost and I am so there! The story was fun and different. Thanks to the author for giving me the book to read. It was well worth the time spent. I thought it was cute. A bit rushed but I’m happy for how it ended! Was a very easy read, but something I’ll find myself reading in the future again. I wasn't sure what to expect with this being labeled as "paranormal romance" but I was pleasantly surprised. After inheriting a haunted mansion from a crazy uncle, Sean sets out to see the manor before he sells it. His fiance doesn't share his enthusiasm about the spirit who shares the home. Lady Charlotte enjoys playing tricks on visitors to the manor. A new owner-especially one young and handsome turns her mind to breaking the curse that has kept her prisoner for so many decades. I wanted more I wasn't sure what to expect with this being labeled as "paranormal romance" but I was pleasantly surprised. After inheriting a haunted mansion from a crazy uncle, Sean sets out to see the manor before he sells it. His fiance doesn't share his enthusiasm about the spirit who shares the home. Lady Charlotte enjoys playing tricks on visitors to the manor. A new owner-especially one young and handsome turns her mind to breaking the curse that has kept her prisoner for so many decades. This ghostly romance pits Sean, the new owner of Breken Manor who is engaged to Michele, against Charlotte, the ghost who inhabits his inherited estate. She has been banned there by an ancient curse set by her mother, and is extremely bored. But when Sean shows up with Michele, her life (or existence) takes on new meaning. Sean seems to be intuitively sensitive to her smell and emotions, and she might just find herself falling in love if she’s not careful. This was a light, fun, shorter read set This ghostly romance pits Sean, the new owner of Breken Manor who is engaged to Michele, against Charlotte, the ghost who inhabits his inherited estate. She has been banned there by an ancient curse set by her mother, and is extremely bored. But when Sean shows up with Michele, her life (or existence) takes on new meaning. Sean seems to be intuitively sensitive to her smell and emotions, and she might just find herself falling in love if she’s not careful. This was a light, fun, shorter read set in a cool background with interesting, unique characters. It’s fast-paced and has some mysteries in it, and enough romance and heart-tugging to appeal to romance readers. I enjoyed it. ***I received a copy of this book from the publisher in exchange for my fair and honest review. A paranormal romance that is sweet and fun to read. Well-written, well-edited, believable characters, and good plot. An enjoyable novella about a curse, a beautiful ghost and a handsome heir-of-the-manor. Good romantic tension. It's hard to go wrong with Heather B. Moore, she's a talented writer. Heather, wow! I LOVED this story! I think I have read another similar or it was this one I beta read. So good. Well written and I love that you stuck to unwritten rules. I LOVED the quotes from Princess Bride. I laughed. Good Job! 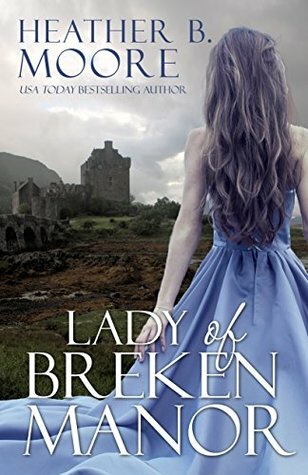 I just finished "Lady of Breken Manor" by Heather B Moore. It was delightful. Sean travels to see his recently inherited manor in Scotland with his fiancé. Little did they know that it was hunted by Lady Charlotte who had been cursed to haunt the home until the owner fell in love with her. Many owners had come and gone by the time Sean inherited. Can a flesh and blood man fall in love with a ghost? It was a quick fun read with likable characters. Lady of Breken Manor is another beautiful read by Heather B Moore. This author really knows how to write great short, clean, romantic historical's. This one is no exception. I loved it! Highly recommended. This was a shorter novella. Charlotte's story of her spirit being unable to escape the place of her death due to a curse intertwines with the present with Sean, the new owner who comes to the manor with his fiance. Fun imagining of a ghost story, loved Sean's ability to 'see' and hear her. His determination, and his courage to try to help Charlotte be free of the curse was a lovely story. Beautiful, sweet fall for both of them, and loved the resolution. I always hope for more with a novella and always tricky to get everything exactly right, but still very well done. A good read for me. I love the variety Heather B. Moore has in her writing! This was a fun one about a ghost that has been forced to haunt a manor house in Scotland. The new owner of Breken Manor, Sean, arrives from America with his fiancé, Michele, to check out what he has inherited from a great uncle. The ghost, Lady Charlotte, has been dead for nearly two centuries. She is destined to haunt the manor until a certain curse has been dispelled. Sean can definitely feel and smell Lady Charlotte, but Michelle is creep I love the variety Heather B. Moore has in her writing! This was a fun one about a ghost that has been forced to haunt a manor house in Scotland. The new owner of Breken Manor, Sean, arrives from America with his fiancé, Michele, to check out what he has inherited from a great uncle. The ghost, Lady Charlotte, has been dead for nearly two centuries. She is destined to haunt the manor until a certain curse has been dispelled. Sean can definitely feel and smell Lady Charlotte, but Michelle is creeped out by the whole idea of a ghost. The more Sean studies Lady Charlotte’s portrait, the more fascinated he is by the beautiful young lady. In the quiet of the night, Lady Charlotte speaks to Sean and a unique friendship begins. There is so much I liked about this fun, mysterious story. It’s relatively short, just under 150 pages, so it’s a quick read. However, I must say also there are a few things that made me pause. I felt like a chapter was missing when Sean drives off for a couple days - we have no idea why. Then he returns a few paragraphs later apparently after having talked to local villagers, Davis Farland and his wife. We readers needed to be part of that conversation! Details were needed as to why Sean had to set the room up like he did, the importance of the day, etc. My other big question: why the two-year gap? I will also add here that I love the cover, but Lady Charlotte’s description was not as accurate as what was written: her hair color was a stretch – ok, it shows a cloudy day so it appeared darker; but her dress is a strapless, big ol’ wide satin gown, and we were told she had a form-fitting, more ethereal gown with short sleeves. (The color was close enough.) The seamstress part of me was bothered with the style inaccuracy. All those details made me take my original 4 stars down to 3. I’ve read many of Heather B. Moore/H.B. Moore’s books and am very impressed with her writing. Overall, “Lady…” was a fun diversion and I am a fan! Definitely an interesting paranormal story. I don't read paranormal books so reading this book was taking a step out from my comfort zone. I surprised myself by thoroughly enjoying it, even though I didn't enjoy the paranormal aspects of the plot. Heather B Moore's writing style is fun and easy to read. The setting of Scotland is lush and so beautiful. There is a love triangle here and I really dislike love triangles, especially ones involving engagements. However, this particular love triangle Definitely an interesting paranormal story. I don't read paranormal books so reading this book was taking a step out from my comfort zone. I surprised myself by thoroughly enjoying it, even though I didn't enjoy the paranormal aspects of the plot. Heather B Moore's writing style is fun and easy to read. The setting of Scotland is lush and so beautiful. There is a love triangle here and I really dislike love triangles, especially ones involving engagements. However, this particular love triangle was easier to stomach because Michele, Sean's fiancée, was so terribly unlikable. Lady Charlotte haunts Breken Manor due to her mother's dying curse. The curse can be broken but she hasn't been successful in over 150 years that she's been haunting the place. She's mischievous and quite selfish, but I guess that's what happens when you've been a ghost for a century and a half. Sean is an American who has inherited the Manor from his great-uncle and comes out to Scotland to restore then sell the Manor. He's dependable, honest, perceptive, and loving.....everything a hero is. The two journey together as Charlotte learns to let down her guard, apologize, and love beyond herself. Anyone who likes paranormal romance will like this book. It was well-written and easy to read. Lady Charlotte is cursed, confined to haunt the halls of Breken Manor. “She was known for running out potential buyers.” She amuses herself with the current tenants, while hoping for the one to beak the curse. “It was because of a man that she couldn’t pass to the other side.” When Sean McKinley inherited Breken Manor, he only planned to sell it and get on with his life. But fate had other plans for him. For 150 years, she has waited for him. He couldn’t touch her or help her but could he love h Lady Charlotte is cursed, confined to haunt the halls of Breken Manor. “She was known for running out potential buyers.” She amuses herself with the current tenants, while hoping for the one to beak the curse. “It was because of a man that she couldn’t pass to the other side.” When Sean McKinley inherited Breken Manor, he only planned to sell it and get on with his life. But fate had other plans for him. For 150 years, she has waited for him. He couldn’t touch her or help her but could he love her? “She felt nothing from his touch, but her heart felt everything.” While she haunts, she is tormented by the sins of her past, the betrayal of her parents. “He is intrigued with this woman, this ghost of a woman. She has completely upended his life. Sean was determined to help her break the curse, even if his own heart broke in the process.” I adored Charlotte’s antics as she torments those who cross her path. Moore humanized this tormented spirit trapped in this prison of her past. Her grief and suffering are tangible. The diary entries intrigued me as truths were revealed. I loved everything about this otherworldly romance of enchantment and fate. *I received an advanced copy in exchange for an honest review. All opinions are uniquely my own. When Sean inherits a manor in Scotland, he plans to put it up for sale as soon as possible. Even when he and his fiancee are warned that the manor is haunted by a ghost who won't let them sell, Sean isn't really concerned. However, when he actually MEETS the ghost--Lady Charlotte--and finds out about the curse that keeps her tied to the manor, he finds his plans changing. I don't really read much paranormal stuff--ghosts and the like aren't really my thing--but I really enjoyed this story. I tho When Sean inherits a manor in Scotland, he plans to put it up for sale as soon as possible. Even when he and his fiancee are warned that the manor is haunted by a ghost who won't let them sell, Sean isn't really concerned. However, when he actually MEETS the ghost--Lady Charlotte--and finds out about the curse that keeps her tied to the manor, he finds his plans changing. I don't really read much paranormal stuff--ghosts and the like aren't really my thing--but I really enjoyed this story. I thought Charlotte's back story was interesting, and I really liked the humorous moments, like when Sean would bait Charlotte to get her talk and she just couldn't help herself. If you're in the mood for a light-hearted contemporary paranormal romance that you can read in an hour or so, check this out. Heather B. Moore is a USA Today bestselling author, with a dozen historical written under the pen name H.B. Moore. Latest is Slave Queen (Thomas & Mercer). Under Heather B. Moore she writes romance and women’s fiction and inspirational non-fiction, latest is Condemn Me Not: Accused of Witchcraft. Her various author names can be confusing so her kids just call her Mom. Visit her blog for writing Heather B. Moore is a USA Today bestselling author, with a dozen historical written under the pen name H.B. Moore. Latest is Slave Queen (Thomas & Mercer). Under Heather B. Moore she writes romance and women’s fiction and inspirational non-fiction, latest is Condemn Me Not: Accused of Witchcraft. Her various author names can be confusing so her kids just call her Mom.